The only zero-emissions top-level rally vehicle proved the potential of renewable energy - even in the world's toughest motor event. The car overcame all adversities in a race that was particularly complicated because of extreme weather conditions. 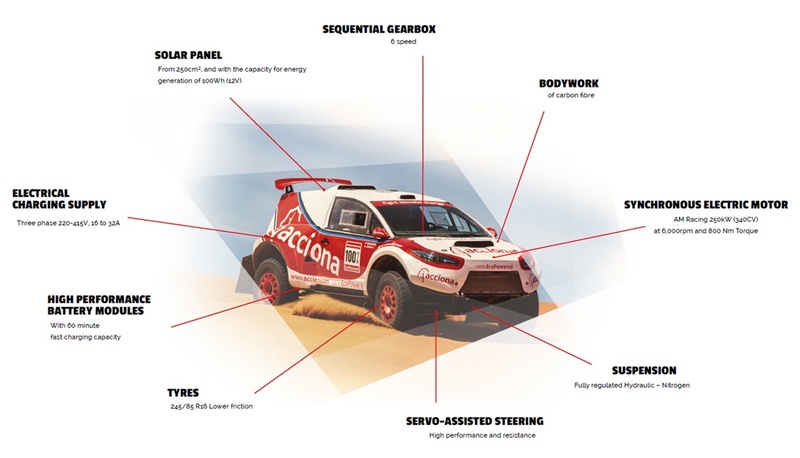 ACCIONA 100% EcoPowered reached a milestone in sport by becoming the first zero-emissions electric vehicle to complete the Dakar Rally, now in its 39th year. By meeting this sustainability challenge, ACCIONA, the Spanish infrastructure and renewable energy multinational, achieved its goals of proving that renewable energy is competitive and of providing visibility to the fight against climate change, in line with the Paris Agreement. The 4x4 vehicle, crewed by Ariel Jatón and Tito Rolón, completed the world's most arduous motor event to reach the finish line in Buenos Aires — the only one of over 18,000 vehicles in the history of the Dakar Rally to complete the event without consuming a drop of fuel or emitting a single molecule of CO2. The 39th edition of the Dakar Rally will be remembered for the extreme weather conditions; the route had to be redesigned after the Río Grande burst its banks, making things particularly difficult for the organisation and the competitors. This year's route, described by the event's sport director, Marc Coma, as "the toughest in South America", saw a withdrawal rate of over 26% in the Cars class, including many of the favourites. Ariel Jatón, pilot of the ACCIONA 100% Ecopowered: "The odyssey is over. This year's Dakar was very tough, with some very intense stages complicated by the weather, and the altitude in Bolivia. It was the most gruelling race in South America, so we are thrilled to have reached the finish line, particularly in an electric car." It's the first zero emissions vehicle to finish the Dakar Rally. Congratulations @ACCIONADakar @ACCIONA_EN! ACCIONA 100% EcoPowered evidenced its reliability in the 12 stages of the rally. The car is the result of five years' research and development led by ACCIONA's R&D and Innovation Department. Made entirely in Spain - in the Barcelona town of Vilanova del Vallés - EcoPowered is the most powerful electric car in the world thanks to its 250 kW synchronous electric motor, equivalent to 340 horsepower. The car is powered by six ultra-fast charging lithium battery modules plus a 100 W solar panel.